layers. Hence the structure is described as a fluid mosaic – the scattered protein molecules resemble pieces of a mosaic. 3 Cholesterol is needed for membrane fluidity and stability. 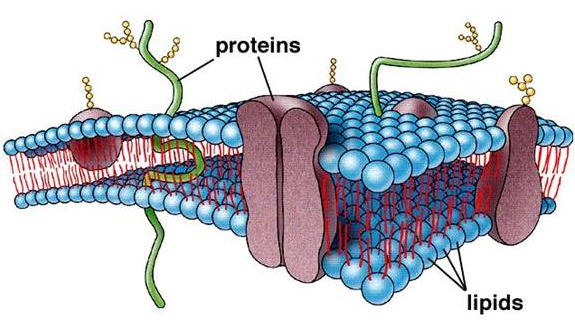 4 Some proteins are transport proteins, transporting molecules or ions across the membrane. They may be either channel proteins or carrier proteins. 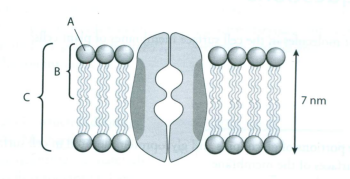 Channel proteins have a fixed shape; carrier proteins change shape. 5 Some proteins act as enzymes – for example, in the cell surface membranes of microvilli in the gut. 6 Glycolipids and glycoproteins form receptors – for example, for hormones or neurotransmitters. They also form antigens, which are cell recognition markers. 7 The cell surface membrane controls exchange between the cell and its environment. 10 Diffusion of ions and larger polar molecules through membranes is allowed by transport proteins. This process is called facilitated diff usion. 11 Water moves from regions of higher water potential to regions of lower water potential. When this takes place through a partially permeable membrane such as the cell surface membrane, this diff usion is called osmosis. solutions, a plant cell does not burst, because the cell wall provides resistance to prevent it expanding. 14 Some ions and molecules move across membranes by active transport, against the concentration gradient. This needs a carrier protein and ATP to provide energy. respectively out of, or into, cells by bulk transport. There are two types of endocytosis, namely phagocytosis (cell eating) and pinocytosis (cell drinking). 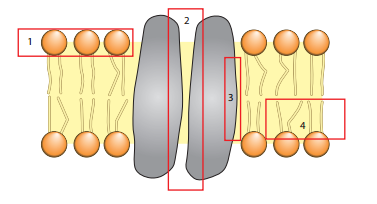 1 The diagram shows a small part of a cell surface membrane. 2 The diagram shows part of a cell surface membrane. In addition to the molecules shown, cholesterol is also present. In which region is cholesterol found? 3 Which component of a cell surface membrane allows the movement of ions across the membrane? 4 The molecules which make up biological membranes have different functions. Which row matches molecules with their functions? 5 A substance moves into a cell through a protein pore. 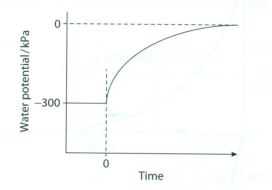 Which of the following describes this movement? 6 Which of the following correctly describes the movement of water by osmosis? 7 Which of the processes that transport materials across a cell surface membrane require energy from the cell’s supply of ATP? 8 A protein is synthesised by a ribosome in an animal cell. What is the sequence of events leading to the secretion of the protein by exocytosis? 9 Examples of the bulk transport of materials into or out of cells are listed. Which are examples of exocytosis? 10 A small piece of plant tissue was placed into each of three solutions, P, Q and R. After one hour, the tissues were examined using a light microscope and the appearance of the cells was recorded. What conclusion can be made about the water potentials of the three solutions? A The water potential of P is greater than that of R.
B The water potential of Q is greater than that of R.
C The water potential of R is greater than that of P.
D The water potential of Q is greater than that of P.
1 Whatare the most abundant molecules in the cell surface membranes of plant cells? 2 Whereare the carbohydrate portions of glycolipids and glycoproteins located in cell surface membranes? 3 The cells of the myelin sheath are wrapped in layers around nerve cell axons. Freeze-fractured preparations of themyelin sheath cell surface membranes show very few particles. This indicates that myelin membranes contain relativelfyew of which type of molecule? 4 Prepare a table to summarise briefly the major functions of phospholipids, cholesterol, glycolipids, glycoproteins and proteins in cell surface membranes. 5 a Describe fully what will occur if a plant cell is placed in a solution that has a higher water potential than the cell. Use the following terms in your answer. b Describe fully what will occur if a plant cell is placedin a solution that has a lower water potential than the cell. Use the following terms in your answer. 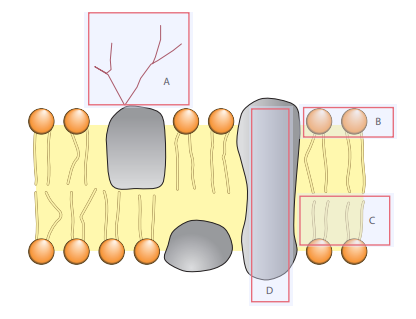 6 The diagram shows part of a membrane containing a channel protein. Part of the protein molecule is shaded. a Identify the parts labelled A, Band C.
iv lightly shaded part of protein. c Explain how ions would move through the channel protein. d State two features that the channel proteins and carrier proteins of membranes have in common. e State one structural difference between channel and carrier proteins. f Calculate the magnification of the drawing. Show your working. 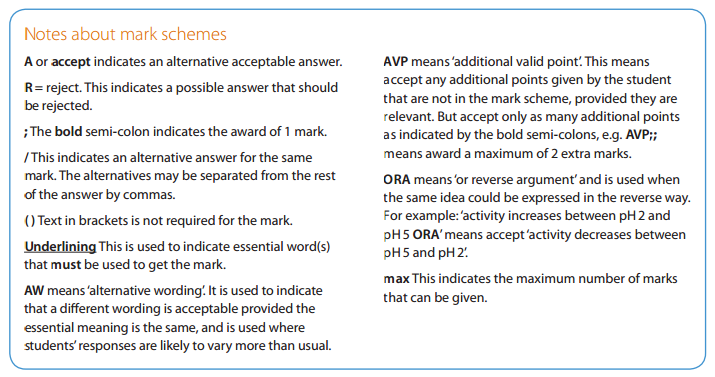 7 Copy the table below and place a tick or cross in each box as appropriate. 8 Copy and complete the table below to compare cell walls with cell membranes. 9 A cell with a water potential of -300 kPa was placed in pure water at time zero. The rate of entry of water into the cell was measured as the change in water potential with time. The graph shows the results of this investigation. 10 The rate of movement of molecules or ions across a cell surface membrane is affected by the relative concentrations of themolecules or ions on either side of the membrane. 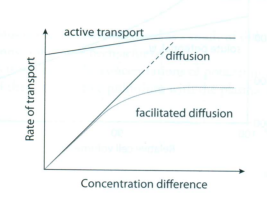 The graphs below show the effect of concentration difference (the steepness of the concentration gradient) on three transport processes, namely diffusion, facilitated diffusion and activetransport. a With reference to the graphs, state what the three transport processes have in common. c i Which one of the processes would stop if a respiratory inhibitor were added? d Explain the difference between the graphs for diffusion and facilitated diffusion. iii Explain why the pressure potential curve is not linear. 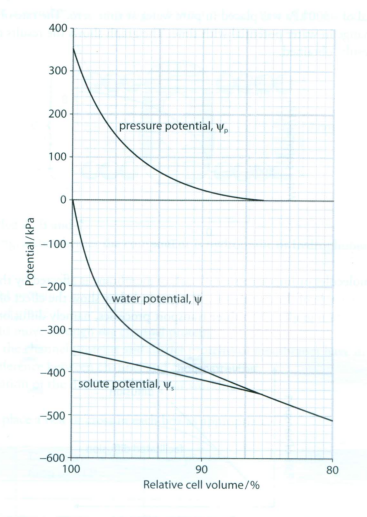 iv State the water potential when the cell reaches maximum turgidity. v State the equation which links Ψ p, Ψs and Ψ.
vi Describe what is happening to the cell between the point identified in c ii and c iii above and 80% relative cell volume. d As the cell changes volume, the change in solute potential is much less than the change in pressure potential. Suggest an explanation for this. 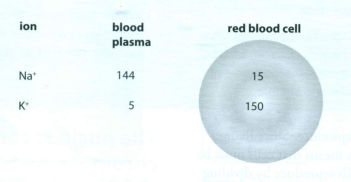 12 Thediagram shows the concentration in mmol dm-3 of two different ions inside a human red blood cell and in the plasmaoutside the cell. a Explain why these concentrations could not have occurred as a result of diffusion. b Explain how these concentrations could have been achieved. c If respiration of red blood cells is inhibited, the concentrations of potassium and sodium ions inside the cells gradually change until they come into equilibrium with the plasma. Explain this observation. 4 Information for constructing this table can be found on pages 72–73. 5 a Information for answering this question can be found on page 77 and in the answer to SAQ 4.5.
b Information for answering this question can be found on page 77 and in the answer to SAQ 4.5. N.B. It could be argued that facilitated diff usion is controllable, because the number of channel proteins in the membrane can aff ect the rate. I don't understand. Where are exactly the pages? I think the post indicates the pages from the book "Cambridge International A/AS-level Biology course book" used for this summery but the pages are not included here. Where is the answer for question8? ?